FTS Eiendom in Norway is set to streamline its flow of goods and expand storage capacity with the help of Rubb fabric structures. Rubb won the order to provide four FXG insulated Thermohall® structures measuring 30m (98.4ft) span × 59.25m (184.4ft) long, with 6m (19.7ft) sidewalls. Rubb as its partner to help set up four storage halls (1,800m2 (19,375ft2) each). The concept includes rental of warehousing space for customers who need space near the growing import port in Fredrikstad. In order to keep costs and rental rates down, FTS Eiendom decided not to build traditional warehouses, and selected insulated Thermohalls provided by Rubb instead. “We could have built an ‘ordinary’ steel building, but it was twice as expensive, and the rental cost per square metre had been too high,” says Jon Børresen, General Manager of FTS Eiendom. Rubb warehouses are a cost-effective alternative and sustainable solution to conventional structures, which are able to adapt to the changing requirements of the end user and their clients. Large clear spans and high translucent ceilings provide a bright, efficient working environment. 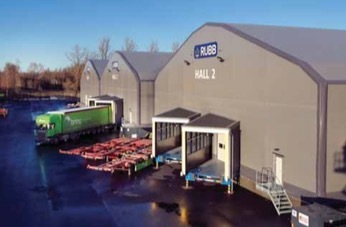 Rubb storage warehouses are built to last but are fully relocatable or extendable to meet changing needs. This type of warehouse chosen by FTS Eiendom helps save on costs and is able to adapt to the changing requirements of the end user. Rubb structures can be custom- designed to support a variety of bulk handling methods. These relocatable buildings highly flexible storage warehouse systems as they can be easily and quickly reconfigured/relocated to suit the changing requirements of a busy port. Rubb Buildings Ltd is a renowned designer and manufacturer of custom- made relocatable engineered fabric structures. Highlights include ground-breaking military buildings (aircraft hangars, shelters, storage facilities), specialist sports buildings and structures for a variety of sectors including aviation, ports, construction, bulk storage and environ- mental (waste and recycling). All products are designed and manufac- tured at Rubb’s UK plant at the Team Valley Trading Estate in Gateshead, Tyne and Wear. The company was founded in 1977 and has a proud history of delivering innovative and quality structures to a wide range of clients.